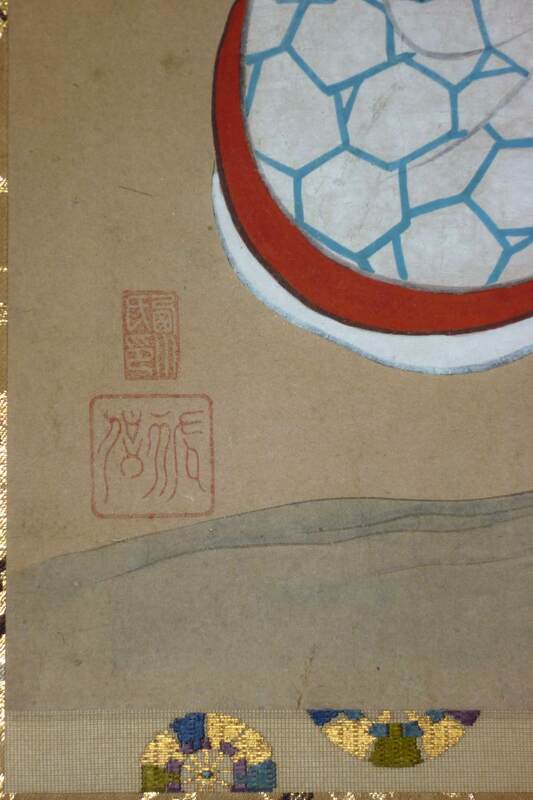 A fine urushi-e hosoban showing the actors Sawamura Sojuro I ( above ) and Yamamoto Kiyoshiro I wrestling amongst bales of rice. It is impossible to be certain of the performance as records are scant, but Sojuro is probably playing the role of Sano Genzaemon and Kiyoshiro is probably playing Sano Genta in the play Miyakozome kaoru hachinoki performed at the Nakamura-za in the 11th month of 1739. 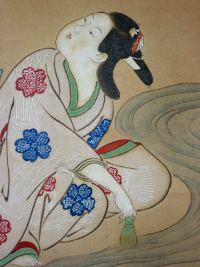 Kiyoshiro was from the Kamigata region and only arrived in Edo in this month. He left for Osaka the following year. 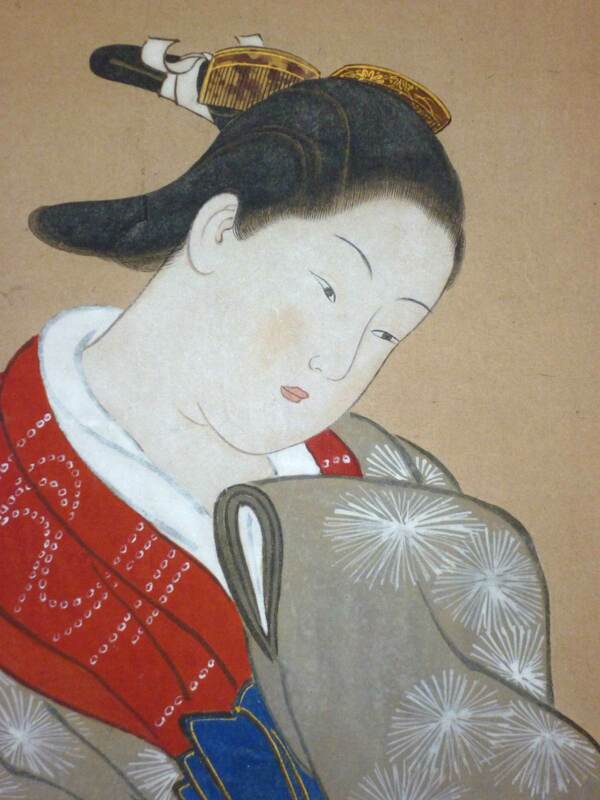 Although he did visit Edo once before this date, he did not act with Sojuro at that time. Very good impression. The hand-applied colours well retained. Small restorations to the sumi/brass, otherwise good condition. 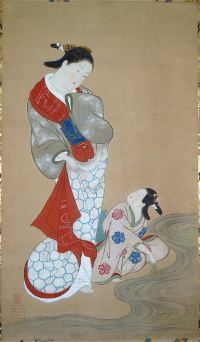 Signed Torii Kiyonobu hitsu. An overlarge oban, 19.5 x 12.25 in; 49.5 x 31 cms. Coloured by hand with tan and mustard yellow. 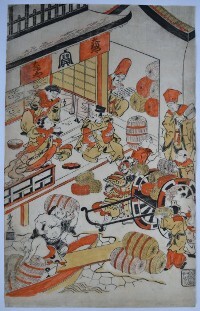 Shows the emporium of Daikokuten, the God of wealth and one of the Seven Lucky Gods (Shichifukujin). He is shown at the top seated in front of a pair of scales. 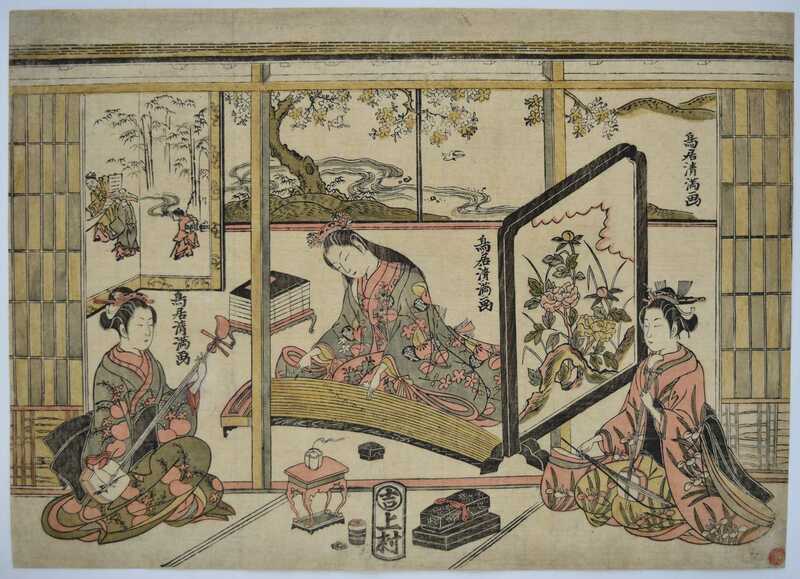 Seated before him, to the left, is Benzaiten, the Goddess of love and music. On the right is Ebisu, God of fishermen and good luck. Behind him is Fukurokuju, the God of happiness and wealth, using an abacus. 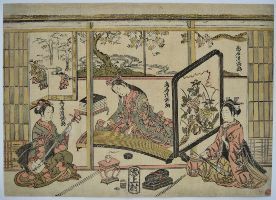 On the far right is Jurojin, the God of longevity. 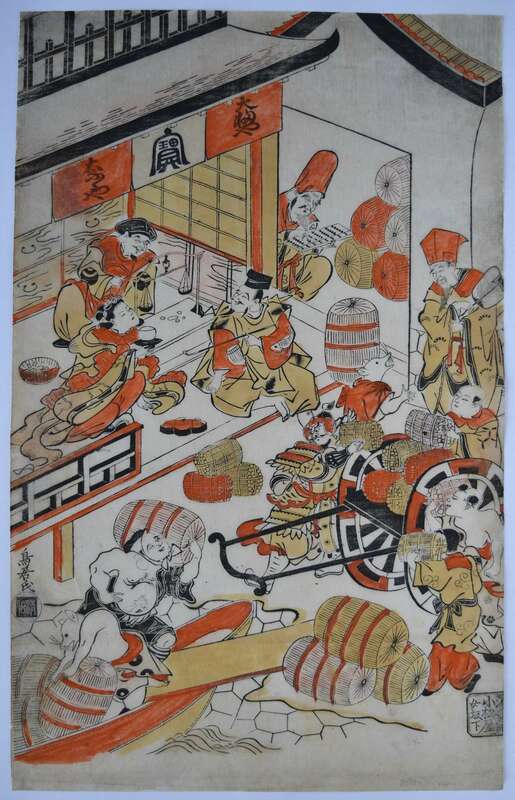 Below him, next to the cart, is Bishamonten, the God of war and warriors. At the bottom, stepping from the boat, is Hotei, the God of happiness. All the Gods are helping, together with rats, to unload bales of rice. The earliest depictions of the Seven Gods are in the second half of the 17th century and are amalgams of Indian and Chinese lore. This early rendition still hasn’t the fully developed characteristics of the Gods – especially Hotei – which we see in the 19th century. Published by Komatsuya (who published c. 1707-1734) c. 1710-1715. Little is known of Kiyomasu’s early career. 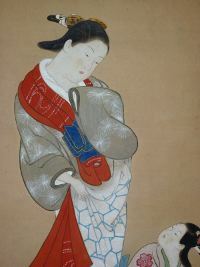 He may have been the brother of Kiyonobu. An important painter and print artist. Of the utmost rarity: probably the only impression extant. Very good impression. Some expert edge restoration, otherwise very good colour and condition. Signed Torii shi with Kiyomasu seal.